So you haven’t yet figured out the airborne conditioning-agent release program that is being operated by the government. I’ll give you some hints, but first I’ll give you a little information about myself. I’m a retired government scientist with an advanced degree in one of the health-related disciplines. I do not use my real name for fear of retaliation, either against me, or against members of my family. I always try to route my e-mail communications so that they appear to come from another source, usually from one somewhere within the government. Sometimes I use the internet resources of the public library – whatever it takes to hide my true identity and confuse those who don’t want the sort of information I possess to fall into the public’s hands. I have a small circle of friends who are, or were, in key positions within our military and several government agencies. These are not the very top level personnel, but mid to upper mid-level people, scientists and analysts, who are in positions where they can see the day-to-day activities of what’s going on, who are charged with implementing the details, but who are never quite privy to the schemes behind the work they do. Each of my contacts has been able to supply me with a portion of the puzzle, but separately, none of them understands the whole story. I’ll tell you what I’ve pieced together so far. But I have to admit that this information frightens me because there is no place I can go with it. What am I supposed to do – write my congressman? I believe that would be like signing my own death warrant. This whole chemtrail issue is related to the plan for decreasing the world population to around 450-500 million — and starting with the US first. Why? The people of the US are the only ones with even the remotest chance of stopping this. That is, if they knew about it. That’s why the US has to be the first to go. You have to understand that the world’s elite covet the US for its geographic diversity – and they would love to return this country to its condition as it existed prior to Columbus setting foot here, but without the Native Americans this time of course. You may have already heard how several national parks have been designated as world biospheres – that’s the plan for all of North America, a giant nature park and playground that will be devoid of annoying human beings (that would be us). 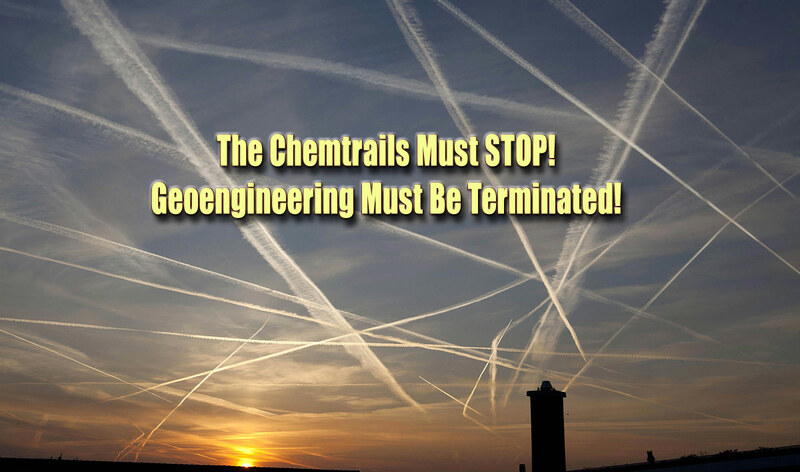 And the people actually involved in doing the spraying, as well as those who will take part in the rest of the plans, are being duped into believing they will be spared, that is, permitted to live and remain on this continent as administrators and caretakers of this vast nature preserve. I understand that about 150 to 200 thousand people are projected as necessary for maintenance purposes. But it’s likely these people will not be Americans. Those in charge wouldn’t want to risk the possibility of some sort of revolt, so the workers will probably be brought in from Europe and Asia. Each year the US government has guessed which strains were most likely to spread. They seem to always guess right – don’t they? This flu season, the government protected people with a trivalent vaccine that included the A/Beijing/262/95-like (H1N1) and the A/Sydney/5/97-like (H3N2). It also contained the B/Beijing/184/93-like hemagglutinin antigens. For those not familiar with virology, the H and N refer to proteins on the outside of the virus, the hemagglutinin and neuraminidase, which are responsible for the virus attaching to, and then invading, a host cell. The public has been quite pleased with the success of the vaccines offered so far. But that will change in the future. Researchers at the US Army Medical Research Institute of Infectious Diseases (or USAMRIID) at Fort Detrick in Frederick MD have reconstructed and modified the H1N1 Spanish Flu virus, making it far more deadly than it ever was back when it was responsible for the 1918-1919 flu pandemic that killed over 20 million worldwide and over 500,000 here in the US. Consider that it could have killed many more, but back then, people couldn’t hop on a jet and travel from New York to L.A. in five hours. Now, our ability to travel will increase the spread and will be our downfall. The flu vaccines contain killed virus and protect the body well against challenge by that particular strain, but work poorly against other strains not included in the inoculation. At some point, the vaccine stockpile will include the more lethal modification of the 1918 H1N1 in its live form. Most people receiving this vaccine will simply be renewing their annual flu shot, and the vaccine will still include the inactivated version of the more benign form of H1N1 (as was included in this year’s vaccine). The presence of the milder strain in the inoculum will slow down the progression of the more lethal H1N1 form, so people will become sick more slowly – but they will still eventually die. It will just take a few weeks longer. If you will remember back to 1968 and ’69, the Hong Kong flu, which was influenza A type H3N2, killed over 30,000 people in the U.S. alone. That was a fortuitous learning event for some because it taught them that the flu could still conceivably be used to wipe out a population. But at the same time, it pointed out the need to precondition the populace so that those who might normally be resistant could be rendered susceptible. Hence the development of the vaccine program and the aerial spraying procedures to condition the population. The purpose of the chemicals in the chemtrails is to help the viral envelope fuse with lung cells, permitting easier penetration and infection. But what about those few individuals who don’t succumb to the flu? Probability alone demands that there will be some who survive – pockets of the population that are either not reached or somehow (and this is less likely) are resistant to the lethal H1N1 strain. At this point you must also remember that our military personnel have been immunized against a variety of pathogens, including the anthrax bacillus. For those geographically isolated areas where the flu doesn’t do its job, it’s a fairly simple matter to lay down anthrax spores and then send in what’s left of the military to take care of anyone still breathing. The anthrax spraying will probably come under the guise of a flu protection program to save those still alive after the epidemic. And the military, having been exposed to civilians with the flu, will eagerly await their own flu shots. I should emphasize that this is a last resort scenario. Those orchestrating the plan will not want to use anthrax until all other possibilities are exhausted – this because of the long-term viability of anthrax spores. To scatter them over the countryside would mean the area would be dangerous for use by humans, at least those not vaccinated against the bacteria.